I’m an avid collector of stories. It doesn’t matter who the teller is. Whether it’s uplifting or sad. Honest or far fetched. I greedily cram the pockets in my brain full with them. Epics squashed next to tragedies wedged between romances, bundled together waiting for an occasion to be dusted off and given the glory they deserve. I come from a long line of story collectors and tellers and from an early age I knew their value. My great grandfather would come home from work everyday with an anecdote about a person he’d met or a reason for why he was late. As children, my nan regaled us with tales of evacuation during the war. Mum wrote about the adventures our family had in a local newspaper column when we were young. And my dad’s a walking story magnet who holds a room in the palm of his hand as he recounts them. These tales get passed down from generation to generation and brought out whenever we’re together like rare family treasures. They’re our inheritance. I’m lucky people feel compelled to want to share their stories with me too so my collection always grows. My mum says I have the sort of face that makes people want to tell me about their lives within seconds of meeting me. Over time stories have become the thing fueling me. I’m like a story vampire hunting down prey, craving my next hit. It was no surprise that when diagnosed with Parkinson’s three years ago at the age of 29 my first instinct was to talk about it with anyone who’d listen. I opened my heart to strangers on buses, colleagues at work and the masses on social media. It seemed like the biggest, most preposterous story I’d ever have the fortune to own and I wanted to be the one to tell it. At first I told my tale to clear my own head but over time I noticed there was an audience and an appetite for its twists and turns. It helped people on some level to know even the most woeful saga can have a happy ending. It made me wonder if people would enjoy my other stories too; the ones in my pocket and the ones handed to me. So I wrote them down, stitching them together into a biography and my book Dropping the P Bomb was published in April this year. The chatty emails I get weekly from its readers give me in turn more stories to store and tell. I was lucky to be a winner of the CharityComms Inspiring Communicator Awards last year for my work with Parkinson’s UK, a charity who share my yarn proudly with an enthusiasm that tells me stories mean a lot to them too. They should because they’re like gold dust. Stories are valuable and every organisation should be seeking them out. They add authenticity, relatability, honesty and humanity. They add a personal touch that can reach in and connect with people’s heart. They offer proof your organisation’s work is vital and set you apart. Everyone has stories they could tell. Some share them, others save them for themselves peeping into their pocket from time to time to remember how funny or sad they were. They don’t know how to share them because they feel too personal and too important to just toss out into the world to face heckling and criticism. When an organisation champions a story they have a duty to set it down in the big wide world with kid gloves, to put a safety net around it and guard it like its their own. When a storyteller sees their tale being looked after so carefully and prized so highly, they’ll share again and become the advocates an organisation can’t do without. I’ve learnt from my dad 90% of the success of a story lies in the telling and I’ve witnessed many great tales fall on deaf ears because the moment chosen to air it wasn’t right or the audience weren’t ready. I feel lucky to have been given platforms to shout my story from without interruption. Newspaper columns that run full-width. Stages with no heckling. TV interviews without ad breaks. It also helps that I’ve been given such a gritty plot line, a tear-jerking up-lifting melodrama of a story that people want to hear and is easy to tell. I love sharing it because it’s a huge part of who I am and I’m proud of it. It helps others with Parkinson’s to know they’re not alone. It buoys people going through hard times. It gives people an unexpected giggle. In my collection of stories this will always be my trump card, the one that no other story can beat, but I’ll sure enjoy spending my life trying to find one that does. Great stories happen to those that can tell them. Emma shared her story at Being The Story in 2016, held and created by Sounddelivery. Emma Lawton is a 33 year old creative director living in London. She was diagnosed with the degenerative neurological condition Parkinson’s at the age of 29. Since her diagnosis she has also become an award winning charity campaigner, spokeswoman for the condition, writer and online store founder. 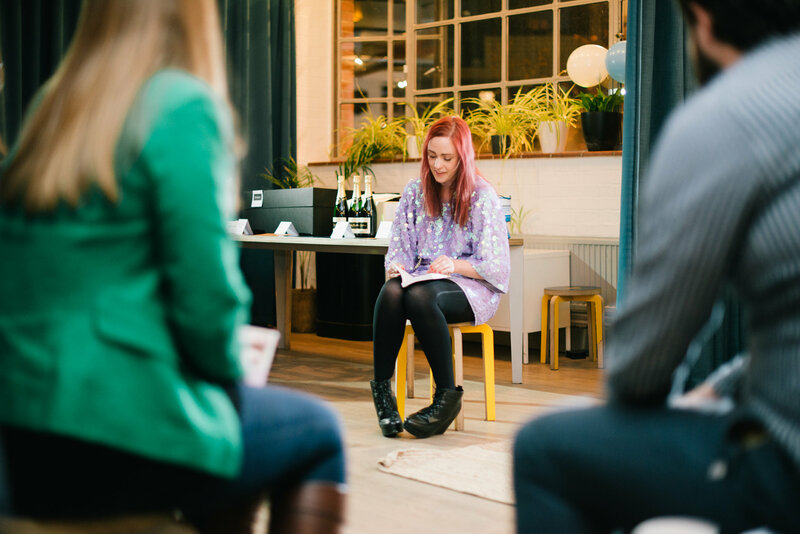 Emma launched her book Dropping The P Bomb, an honest account of her first year after diagnosis, in April this year. She’s never met a sequin she didn’t like and 90% of her wardrobe is unworn ball gowns.